This bagged kit is nice because it's easy to store, keep on a truck, in a man basket, etc. The harness is a no-frills yet totally sufficient style, still offering 5-point adjustability and strong contractor-grade webbing. Mating buckles for legs and chest, plus a lanyard keeper make this harness simple and affordable. The 8259 lanyard is simple yet effective, it's fixed at 6 ft in length and has an integral shock absorber that keeps weight down and makes the lanyard less of a nuisance to wear. 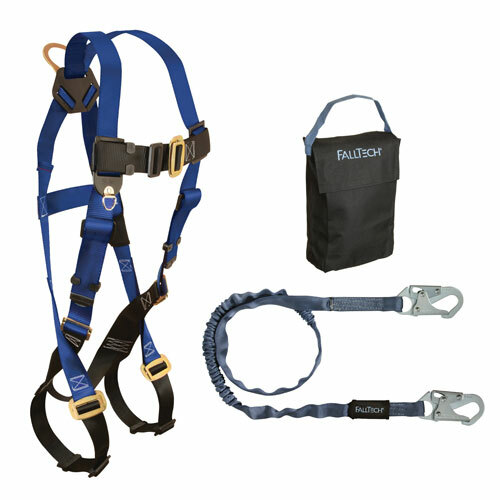 This is a universally sized harness with 5-point adjustability for a great fit! This 6ft lanyard is ANSI Z359.1-2007 compliant and features double-locking snap hooks on each end. Convenient carry / storage bag has a Velcro closure and convenient looped handle for toting .